Product Description: A300 for chemical fiber is an anatase titanium dioxide manufactured by the sulphate process adopting international advanced technology and device. It is not soluble in water, no physiological toxicity and with high chemical stability. Especially it has outstanding optical performance with the key features such as very high purity, lowest iron, smaller particle size and narrow particle size distribution. Also it is blue undertone with excellent whiteness, and very easy to disperse both in water and ethylene glycol solvent. Applications: Anatase titanium dioxide A300 takes advantage of refraction force difference between titanium pigment and chemical fiber, with itself very high whiteness, superior tinting strength and hiding power, it can reduce light reflex force of chemical fiber, improve its opacity and eliminate unsuitable gloss so as to achieve the similar function of natural fibers. 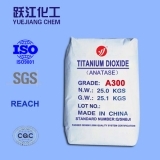 Anatase titanium dioxide A300 is mainly used as delustering of chemical fiber such as polyester fibers, viscose fibers, polyamide fibers, polypropylene fiber, etc. Basic Information: Name：	Titanium Dioxide (TiO2) CAS NO.：	13463-67-7 EINECS NO.：	236-675-5 Color Index：	77891, pigment white 6 ISO591-1:2000：	A1 ASTM D476-84：	I Appearance：	White powder Specific gravity：	3.9 g/cm3 Technical Specifications：(Standard：Q/SNBJ1-2012) Property	A300 TiO2 Content %	≥98.5 Color (compared with standard sample) ∆L*(sample-standard sample) ∆s=(∆a2+∆b2)0.5 Not Lower than ≥-0.3 ≤0.5 Matter volatile at 105oC %	≤0.3 Matter soluble in water %	≤0.4 Residue on sieve 45μm %	≤0.03 PH of aqueous suspension	6.0-8.0 Brightness %	≥98.3 Tinting strength(compared with standard sample) %	≥105 Resistivity of aqueous extract Ω•m ≥30 Loss on ignition %	≤0.35 Water dispersion %	≥92.0 Rutile %	≤0.5 Fe2O3 %	≤0.005 Package: 25kg paper-plastic compound bag, or as clients' requests offer 500kg/1000kg big woven plastic bag. Storage and Safety: The product is a kind of white powder which is safe, nontoxic and harmless. Keep from moisture during transport and should be stored in a cool, ventilated, dry place. Avoid breathing duct when handling, and wash with soap & water in case of skin contact. For more details, please refer to the Material Safety Data Sheet.